The first fix comprises of a brass pipeline termination cylinder with a 12mm BS EN 13348 copper pipe for brazing to the fixed pipeline system, or with a NIST BS EN 18082 (non-interchangeable screw thread) connector for connection to a hose assembly. A mounting box suitable for both surface and flush installations is also provided. 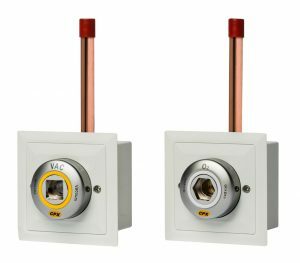 CPX British Standard and DIN Standard Gas Outlets utilise a common first fix assembly. 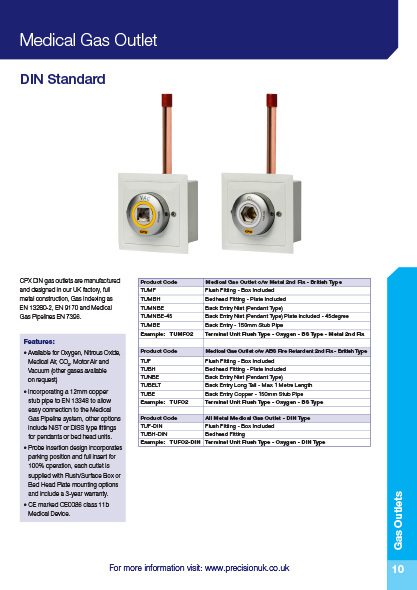 The CPX Terminal Unit is designed to enable gas probes to be connected and disconnected easily and with minimal effort and the same time as giving a strong, reliable and secure connection. They are available for oxygen, nitrous oxide, 50% oxygen/50% nitrous oxide mixture, medical air, surgical air, medical vacuum, carbon dioxide, nitrogen and AGSS. 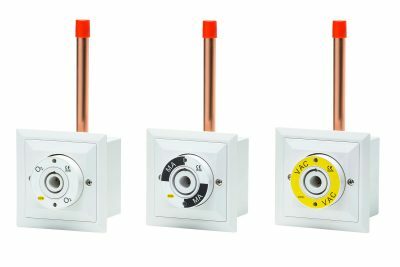 The terminal units can be flexibly integrated into any type of installation including surface, flush, bedhead and pendant and are supplied with a 3 year warranty. Test plugs are included with flush, surface, and bedhead types for first fix pressure testing on site. 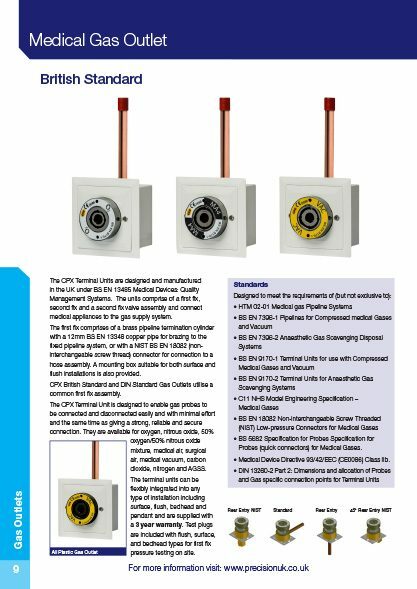 CPX DIN gas outlets are manufactured and designed in our UK factory, full metal construction, Gas Indexing as EN 13260-2, EN 9170 and Medical Gas Pipelines EN 7396. BS 5682 Specification for Probes Specification for Probes (quick connectors) for Medical Gases. Medical Device Directive 93/42/EEC (CE0086) Class IIb. 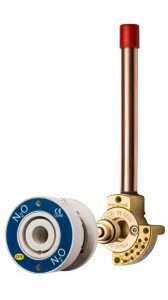 Incorporating a 12mm copper stub pipe to EN 13348 to allow easy connection to the Medical Gas Pipeline system, other options include NIST or DISS type fittings for pendants or bed head units. Probe insertion design incorporates parking position and full insert for 100% operation, each outlet is supplied with Flush/Surface Box or Bed Head Plate mounting options and include a 3-year warranty. CE marked CE0086 Class IIb Medical Device.